Discussion in 'Army' started by Player 0, Nov 27, 2018. Hi everyone, i was wondering if anyone knew any good sources on China's special forces. No clue. But try reading about their anti-piracy operations in the Straits of Hormuz. GUANGZHOU, Feb. 1 (Xinhua) -- Each loaded with more than 30 kg of gear, groups of young men in field uniforms trek across mountain forests or deserted island, covering a distance of over 35 km every day, with about four hours rest. For a week, they are supplied with two bottles of water every day and self-heating food for the first three days. This is not wild survival, but the intensive week-long training of the special operation Snow Leopard Commando Unit, one of China's anti-terrorism forces. Created in 2002, the unit is mainly tasked with urban anti-terrorism missions. It has safeguarded dozens of major events, such as the Beijing Olympic Games, the Boao Forum for Asia and China International Import Expo. It has taken part in more than 10 major military exercises and joint drills and trainings with foreign counterparts. It has also participated in the Annual Warrior Competition of international special operations for five years and won two championships. On its emblem is a roaring snow leopard, which embodies allegiance, tenacity, resourcefulness and valour. For the Snow Leopard commandos, allegiance means taking every training session seriously, mastering military skills and completing tasks. Training tests the endurance and willpower of the commandos. Captain Wang Hang said that in the intensive week-long training held every quarter, the commandos needed to complete more than 50 tasks. One of the tasks is simulating rescuing the wounded, which requires the commandos to lift "the wounded" up to the top of a slope for "treatment," with stretchers made by themselves. They must restart lifting if the stretcher touches the ground. Their routine training is also challenging, which includes a 5 km cross-country run and 150-kg deep squat. Commando Zhao Yiyang said their uniforms were often stained with sweat and, especially in summer, would harden and even "stand" on the ground if not washed for two days. High-intensity training results in good military skills. Lai Jidong set the record for climbing 18 meters high with a rope in around 19 seconds, the fastest in the unit. Zhao Jinpeng can take out his gun, remove the safety, aim and hit the target within 1.5 seconds. Captain Liu set the record of climbing up to the fifth-floor balcony in 6.07 seconds, which has not been broken. "An excellent commando should always pursue going faster, higher and stronger," he said. Liu was selected to participate in the Annual Warrior Competition for three consecutive years and helped win two championships. In 2014, he postponed his marriage and led the Snow Leopard team to the competition, which was held in Jordan and participated by 33 teams from 18 countries, including the United States and Russia. He took the lead in completing events in a high-quality manner, enduring the pain of a sprained ankle. The team defended the championship under his guidance. Liu has set an example for his soldiers. Zhao Yiyang, a member of the post-90s generation from north China's Hebei Province, decided to join the commando unit after hearing about it from his cousin, who was a commando before. "I was eager to experience a different life from the comfortable one at home," he said. In order to better prepare for maritime anti-terrorism tasks, Zhao made every effort to practice diving. At first, he could only dive 4 meters deep in pools or lakes, but now he can easily dive as deep as 15 meters in the ocean. "The seawater tastes so salty and bitter, even numbing my lips," he said. The Snow Leopard Commando Unit has won people's recognition and trust. Zhao recalled that when they performed a security task in Sanya, south China's Hainan Province last year, local stores voluntarily offered them discounts, thanking them for their sacrifice and services. "We will all show allegiance to our country and the people for life, even after we retire," he said. Yodello, N00813 and Equation like this. most of what you see in the news I would not even consider special forces. they probably have better fitness and maybe slightly more advanced individual skills and small team tactics. But in western armies there are also reconnaissance sections and platoons with soldiers of this kind and they are not considered special forces. ALL infantry in any army practices reconnoiter either in platoon size or squad size elements. Even mechanize infantry does it as well. it's true that basic reconnaissance techniques are practiced in many professional armies (not sure about the Chinese army but there probably are some training of that sort for regular grunts). However, one should not confuse such practices with capability. There is a reason why separate basic and advanced recce (or recon if you are American) courses exist for those assigned to sub-units dedicated to that function. For regular grunts, recce training serves more as a training tool for field craft and leadership. In reality no unit would employ a regular grunt with just basic knowledge in recce for that role, one will have to have done a specific recce course, which includes very detailed SOP's and skills/knowledge, and normally has a very high failure rate. old picture of PLASF member practicing HALO/HAHO. Apparently the program died. Equation, N00813 and jobjed like this. 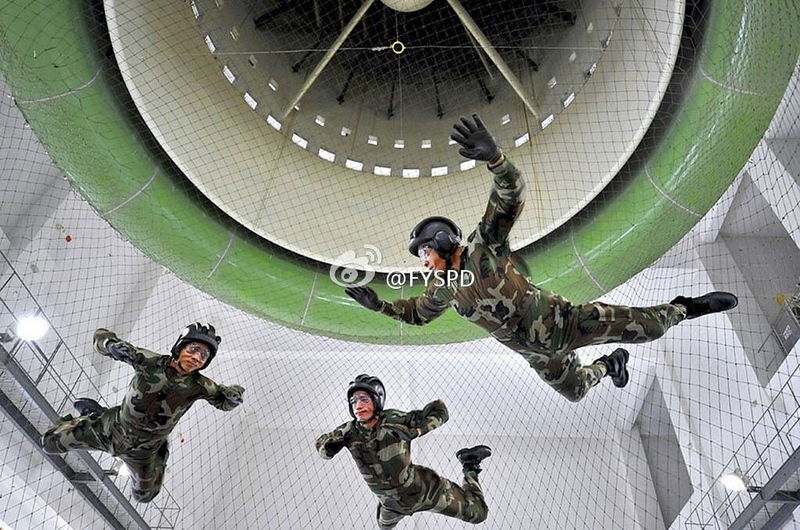 The Chinese Special Force Basic Training And Its Effectiveness?